Until his recent retirement, Roy Weare had a very busy and enjoyable professional life as a GP. However, since retiring he has been able to devote much more time to woodturning, which he describes as a 'passion'. 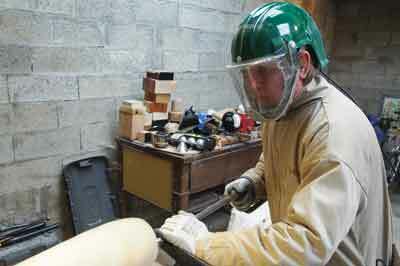 Roy told us that he originally got into woodturning 'by accident'. He explains: "Over 20 years ago there was a sale in a local store and I bought on impulse a woodturning kit that attached to my electric drill. Aided by Richard Raffan's videos, I began to turn. Within six months I had purchased a Union Graduate lathe and began turning in earnest." Roy was encouraged in this new interest by fellow woodturners: "Very early on, I had the good fortune to meet and be tutored by some very experienced and excellent woodturners who gave of their knowledge freely and who are still friends today." Most of Roy's work involves turning a hollow form and then texturing the surface using power carving and pyrography. He also likes to open up the solid hollow form to expose the inside in order to see the effects of light and shade. Looking at Roy's work, there appears to be an aquatic theme. He told us more about this: "Many of my pieces have an aquatic or marine appearance but they are not meant to be realistic but rather a collection of ideas and textures." 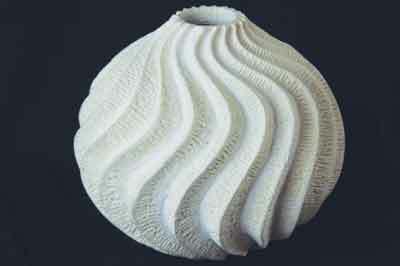 Roy is fascinated by surface textures and produces them by power carving and pyrography. 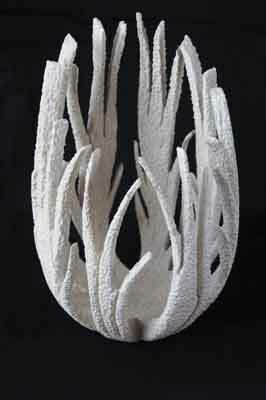 "Many of the textures resemble the surfaces of coral or other marine animals and so I have enhanced my hollow forms to resemble these animals and plants. My recent pieces are heavily textured and the turning is only a small part in their creation. They have been described as 'carvings' rather than 'turning'. I see my work as a continuum and I will continue to use the lathe to create the pieces, which I will then enhance by texturing." Roy told us that making hollow forms has always appealed to him for several reasons: "I found myself drawn to making hollow forms primarily because it enabled me to try to make enclosed shapes with full-flowing contours. Then there was the technical challenge of hollowing out the piece while trying to parallel the outside shape. It was my attempts to avoid a simple hole in the mouth of the hollow form that led to my experiments with texturing and pyrography. Initially, I carved fingers around the mouth, perhaps with some burning and texturing, but eventually the process involved the entire hollow form surface. These early steps owe a great deal to the inspirational work of John Jordan. 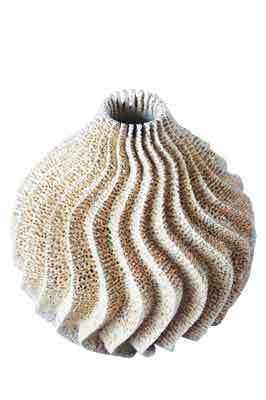 The hollow form shapes that I now make are good for the aquatic creatures that I create and the surface is great for displaying the textures." He tends to use bland, unfigured wood such as sycamore (Acer pseudoplatanus), beech (Fagus sylvatica), maple (Acer campestre) and plane (Platanus hybrida). Roy says he finds it difficult to identify the source of his inspiration: "I do not know where the force and energy to create these pieces comes from. I just know that once I have an idea, I am driven to create the piece." 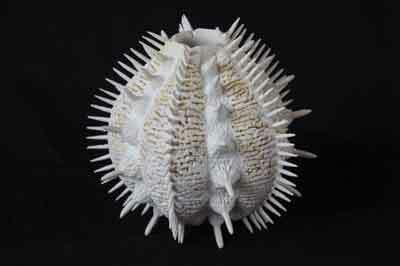 His work has been influenced by other woodturners especially John Jordan, John Paul Fennell, Christopher Lee and Marc Ricourt. Roy's work has changed over the years as he now places more emphasis on what happens with a piece after turning: "I used to be very content to turn a hollow form or a bowl out of an attractive piece of wood and strive to achieve a good shape. Now, I care little for the grain or figuring in the wood and indeed prefer to work with unfigured timber. The turned article is no longer the end but is the beginning of the creative process. I still enjoy turning on the lathe but now it is what I do with the pieces off the lathe that interests me most." The turning of a piece usually takes only a few hours but he then spends one to two weeks on the power carving and texturing. Roy is lucky enough to have three workshops, much to the admiration of us and no doubt many readers! The shop at his home in the UK has a VB36 lathe and a Union Graduate lathe. This is where he spends time turning and texturing his pieces. Near to this, he has another workshop that he shares with three other turners - Phil Steel, Trevor Lucky and Charles Aldam. "We have been friends for many years and have been turning together for nearly a decade. We usually will spend every Sunday at our workshop. It is well equipped and has five Graduate lathes but also space for us to carve, pyrograph and airbrush our work." All four turners help and encourage each other: "I think that this setup must be unique in having four woodturners who regularly meet and create together. One of the most important influences on my work has been the constructive criticism and support of these friends. We inspire one another to try and produce novel pieces of good quality and this has helped improve the level of our turning," he tells us. Royâ€™s third workshop is attached to his small stone house in Brittany, France. This workshop is equipped with a lathe and he has also installed a wood-burning stove. From Roy's description, it sounds like the ideal setting: "The house is in a very peaceful hamlet in the countryside. Since I retired, I am fortunate to spend several weeks there working on my pieces with only a few cows in the adjacent field for company. The quiet setting is very conducive to spending several hours a day producing my pieces." His 'indispensable' workshop tools include a Foredom pendant motor, an NSK Ultimate micro motor and an NSK Presto. Roy is now able to spend much more time woodturning. Previously, when he was working as a doctor, he could only devote six to 10 hours a week to turning but now he can do that number of hours each day. In addition, the isolation at his house in France enables him to fully focus on his work. As a consequence, his productivity has increased markedly. He expects this extra time to also have an impact on the style of the pieces he makes in the future as he will have more time to experiment and perfect different techniques and effects: "I anticipate that my work will become more sculptural, incorporating surface textures and perhaps the addition of colour by airbrushing." The main low for Roy occurred around 10 years ago when he gave up turning altogether. "I did not know what I wanted to make anymore and my enthusiasm dried up. For a couple of years I did not go near a lathe," he says. Luckily, he was persuaded to take up the craft again and has not looked back since. 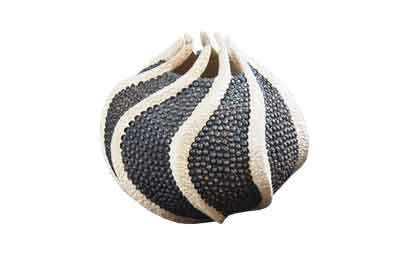 "Eventually my friends encouraged me back and I began to texture and power carve my pieces. I am still riding that wave!" The high points of his turning career so far include having a piece of his work added to The Daniel Collection in 2012 and winning the Tony Boase tribute award at the AWGB 2013 symposium. When asked to nominate the best things about woodturning, he mentions the many friends that he has made among turners and the positive effect it has had on his life: "Woodturning has enriched my life by encouraging me to be creative in an unending process of discovery." When he was working as a GP, Roy had very little spare time for promoting his work, preferring to devote most of his leisure time to turning. "My pieces would be seen by my woodturning friends and at the monthly meeting of East Herts woodturning club. The instant gallery at the AWGB symposium provides a strong stimulus to produce pieces every two years. Therefore, most of my work has only been seen by a relatively small number of people." He explained that he thinks this is a common problem for woodturners and now that he has more time, he will be able to remedy this: "I believe that it is very difficult for woodturners to promote their work in the absence of regular competitions and exhibitions. It is my intention to set up a website in order to display my work and progress." We look forward to seeing more of his work when his website is up and running! We will bring you details when this becomes live. 5. Enjoy your woodturning. It is fun! 5. Striving for perfection and never achieving it! Pick up the latest copy of Woodturning magazine!